Approximately 50 people attended the Rally. Ilam Park stands within the National Trusts South Peak Estate in the Peak District National Park. Ilam Park and the Hall are owned by the National Trust. The Hall, a Gothic style Mansion, has been leased to the YHA since the early 1930s. 20 members stayed in the Youth Hostel and approximately 30 stayed in the Ilam Park caravan site or used other sites or accommodation nearby. The YHA completed a complete refurbishment of the Hostel in the summer of 2009. This has been done to an extremely high standard and totally in keeping with the majesty of this beautiful building. The food was very good. The lounge and bar made for very relaxed evenings chatting about the days rides. On Friday and Sunday a long and short ride was offered. On Saturday one ride of 37 miles was planned. There was also an optional short ride which could be done on any day. This ride made use of the Tissington and Manifold Cycle Trails. Most members found the hilly terrain very challenging. At least two members took the opportunity to walk along the pleasant nearby Dovedale instead of cycling on one day. The weather throughout the weekend was variable. On Thursday it was chilly, bright and a bit windy, but basically dry. Friday was rainy to start but dried out later in the day. It was bright but quite chilly. Saturday was much drier with only the occasional light shower. Sunday was bright but very windy. There was a hail storm mid morning but after that it was clear. Some who did the long ride on Sunday reported being snowed on at one point. Monday was still windy but clear and bright. Friday. Both rides started out east to Carsington Water Visitor Centre. The short ride (22 miles) then returned to Ilam via Ashbourne. The long ride (43 miles) turned South East to Kedleston Hall then East to Londford before returning northwards to Ilam via Ashbourne. Saturday. 37 mile ride. Firstly to Asbourne; then Osmaston and Rocester (home of JCB). The ride then followed the lovely Churnet Vallley from Alton (location of Alton Towers) to Oakamoor. Then through Waterhouses back to Ilam, passing the ruins of Throwley Hall en route. Sunday. 41 mile ride (with 4432ft of climbing- the most taxing ride of the Rally), or a shorter option of 21 miles. 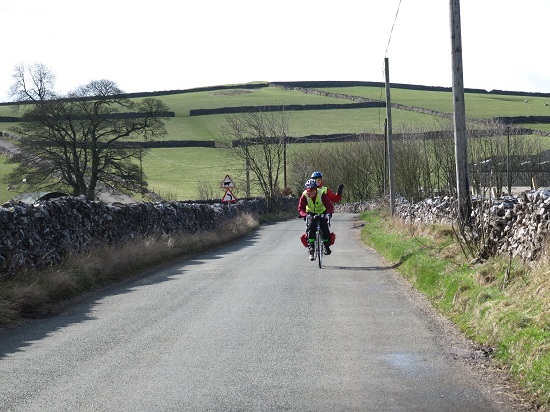 Both rides initially went to Hartington. The long ride then continued north over high Peak District scenery to Axe Edge, passing through Flash (highest village in England) before descending along The Morridge with views over Cheshire, Staffordshire and the Peak District. Some members reported views as far as Wales on this route. The route continued through Waterhouses and more climbing via Calton back to Ilam. 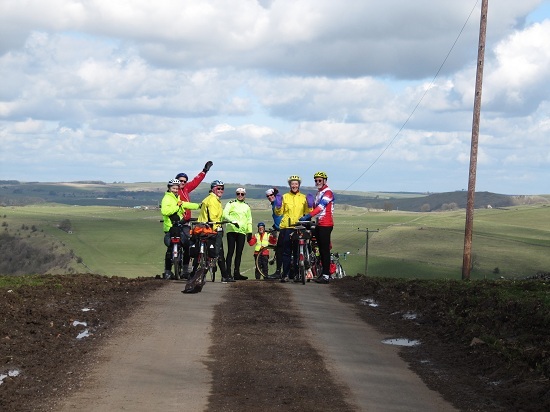 The shorter ride travelled along the picturesque Manifold Trail via Wetton Mill to Waterhouses where it rejoined the long ride for the return to Ilam. Optional Short Ride. This 27 mile ride explored two of the local cycling and walking trails. Firstly going north up the Rivers Hamps and Manifold to reach Hartington via the Manifold Trail. From Hartington it joined the Tissington Trail as far south as Thorpe from where it returned to Ilam. Ilam Hall, its chapel and grounds were used in filming Jane Eyre. The estate and tea rooms are open to visitors. Dovedale, one of the best known and most visited of Derbyshire's dales, is nearby. This valley and surrounding area was used in Jane Eyre, Pride and Prejudice and The Other Boleyn Girl. Narrow roads access the area. It offers easy access to the lovely Staffordshire Moorlands area, and of course to the Peak District to the North. 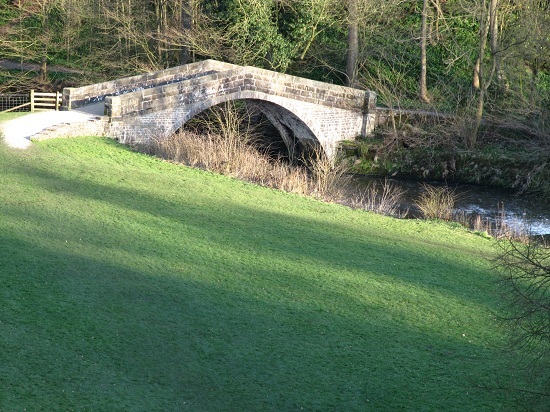 The Tissington Trail, connecting with the High Peak Trail is close to Ilam, offering traffic free access to a large part of the Peaks. The picturesque Manifold Valley can be enjoyed by riding the Manifold Trail. The area abounds with tea rooms and pubs, so refreshment stops are plentiful. "The Youth Hostel Association hostel at Ilam is a Youth Hostel to remember! A Victorian gothic manor house owned by the National Trust, it makes for a civilised break. Its grounds stretch to 84 acres of country park on the banks of the River Manifold, making outdoor games, woodland wanders and riverside walks an appealing possibility." Attractions in the area immediately surrounding the hostel are Alton Towers and the Churnet Valley Steam railway. Obviously the Peak District offers many more visitor attractions, but the main reason to visit the Peaks is for the variety of the landscape and breathtaking scenery. Of course the other feature is in the name. There are lots of hills. Using the cycle trails helps to ease the climbing.